Does a 6,000-year-old earth match the findings of modern science? Secular scientists have answered forcefully in the negative for generations. However, their arguments rest on the assumption of constant natural processes and constant rates, and new discoveries from ICR’s geneticists present a strong challenge to these claims. Ticking within every species is a “clock” of sorts that measures the length of time that a species has existed on the earth. Since DNA is passed on imperfectly from parent to offspring, each generation grows more genetically distant from prior generations. Consequently, with each successive generation reproductively isolated groups within species grow more and more genetically distant from each other. This is true for DNA found not only in the nucleus of the cell but also in the cellular energy factories termed mitochondria. Mitochondrial DNA is present in both males and females, but unlike nuclear DNA, it is inherited only from mothers. Thus, mitochondrial DNA differences among modern individuals within a created “kind” trace back to the maternal ancestor of the kind. For kinds that survived the Flood on board the Ark, modern differences are mutated versions of the mitochondrial DNA sequence that was present in the female representative on the Ark (one representative for the unclean kinds; several representatives for the clean kinds). For kinds that survived off the Ark, modern differences may trace back to the individual females that God created during days three through six of the creation week. Since God likely created many individuals of each kind, some modern mitochondrial DNA differences for off-Ark kinds may be due to God creating DNA differences among individuals and not to mutation over time. Nevertheless, for both on-Ark and off-Ark kinds, most mitochondrial DNA differences among members of the same kind likely reflect the length of time that the kind has existed on Earth, to a first approximation, and thus represent the “ticks” of the mitochondrial DNA clock. These biological facts create a new venue in which to compare the young-earth creation timescale to the secular timescale head to head. The true age of any given kind will be reflected in the amount of mitochondrial DNA diversity among its modern descendants. If kinds have existed on this planet for millions of years, then they should be quite genetically diverse. In contrast, if their origins trace back only 6,000 years, then they should be more genetically homogeneous. As long as the mitochondrial mutation rate has been accurately measured in the laboratory, equation (1) can be used to predict genetic diversity. Comparing these predictions to the range of actual human mitochondrial DNA diversity shows a striking result (Figure 1).4 On average, human mitochondrial DNA sequences differ at 10 positions. The biblical model predicts a range of diversity that accurately captures this value. In contrast, the evolutionary timescale (and, by extension, the old-earth creation timescale) predicts levels of genetic diversity that are 12–29 times off the real DNA differences that we see today (124–290 mitochondrial DNA differences versus 10). 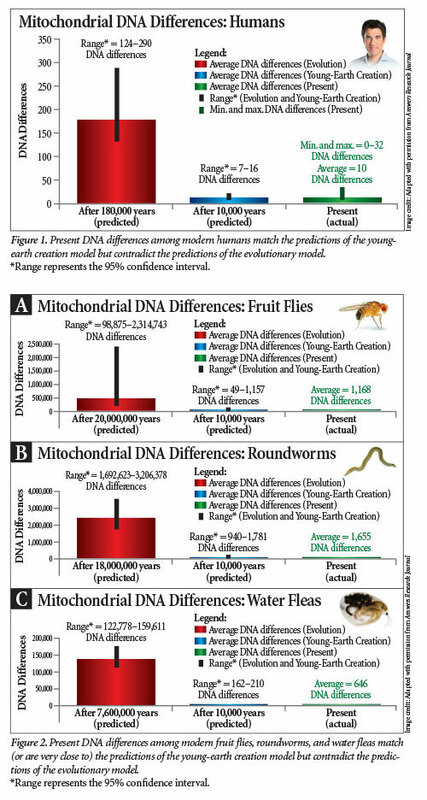 Similar calculations for fruit flies, roundworms, and water fleas depict the same result—evolutionary predictions that are orders of magnitude off from the real DNA differences we see today and creation predictions that either match actual diversity or are very close to it (Figures 2A–C). The evolutionary results cannot in any way be explained by invoking a slower mutation rate in the past. First, this would be inconsistent with the assumption of constant rates and constant processes invoked in astronomy and geology. 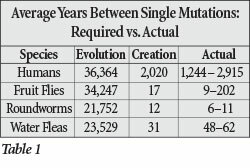 Second, for species to be as genetically similar as they are today yet as old as the evolutionists claim, they would need to mutate only once every 21,000–36,000 years and consistently so for millions of years (Table 1). This incredibly slow rate is completely counter to the actual mutation rates observed in genetics; in fact, rates this slow seem biologically impossible. These results appear to present a dramatic challenge to the millions of years espoused by evolution and old-earth creation, and they seem to powerfully confirm the biblical account. However, a case this simple and powerful will be met with some measure of opposition. Can the evolutionists find a hole in these arguments? Let’s look at their possible objections. Objection 1: The results of this study are contradicted by the many evolutionary molecular clocks published previously. Comparing the clock in this study to the evolutionary molecular “clock” is essentially an apples-to-oranges comparison. While both clocks are based on the same biological principles, the evolutionists have used a shortcut to determine the mutation rate in their version of the clock. Rather than measure the actual rate of genetic change in the laboratory, evolutionists have determined the “ticking” of the clock from the dates they have assigned to the layers in the fossil record. This would be analogous to a young-earth creationist determining the mutation rate by measuring the genetic differences between two species, assuming a date of origin of 6,000 years, calculating the mutation rate from the genetic differences divided by 6,000 years, and then claiming that modern genetic differences confirm a 6,000-year origin for these species. Hence, evolutionary molecular “clocks” are actually a form of circular reasoning, not independent scientific data points, and they cannot logically contradict the results noted in Figures 1 and 2. Objection 2: The results of this study are contradicted by empirically measured molecular clocks for nuclear DNA. Objection 3: The results of this study are based on flawed methods—too few modern individuals were represented. Inclusion of more modern individuals when tallying actual genetic diversity fails to help the evolutionary model for two reasons. First, the rate of mitochondrial DNA mutation might be different in the lineages that led up to these additional individuals. Hence, if the evolutionists wish to better represent the worldwide diversity in mitochondrial DNA sequences, then they must also better represent the worldwide diversity in mitochondrial DNA mutation rates. Any increase in actual genetic diversity afforded by more individual sequences might be counteracted by the discovery of faster mutation rates in these new lineages. Second, the magnitude between actual diversity and predicted diversity is far too great a gap to be bridged by even a hundred more DNA sequences from additional individuals or species. Sampling error does not reconcile evolutionary predictions with reality. Objection 4: The results of this study are based on flawed methods—too few historic/fossil individuals were represented. Fossil DNA sequences were deliberately omitted from this study because they are too fraught with scientific uncertainty. Our own in-house analysis revealed that most fossil DNA sequences are highly degraded and unreliable. Furthermore, it is currently impossible to verify the accuracy of these sequences, even if they do not appear degraded, since we lack an independent means to verify their accuracy. (The evolutionary interpretation of the fossil record is not an independent test.) Finally, even if fossil sequences were reliable, the magnitude between actual diversity and predicted diversity is far too great a gap to be bridged by the inclusion of fossil DNA sequences. Again, sampling error simply does not reconcile evolutionary predictions with reality. Objection 5: The results of this study falsely represent the evolutionary expectations. Mutational saturation and homoplasy (independently acquired identical mutations) would lower the absolute value of the expected DNA differences under the evolutionary model. Mutational saturation could theoretically rescue the evolutionary model but fails to do so for lack of scientific evidence in its favor. If the individuals in this study had mutated to saturation such that every DNA position had been mutated, then the DNA identity between them should have been no different than a random alignment of DNA sequences. Since every position in a DNA sequence has four possibilities due to the four bases—A, T, G, C—in the DNA code, a random alignment matches 25% of the time by chance and mismatches 75% of the time. None of the comparisons in this study even came close to 25% identity. The lowest match was 86%—far in excess of 25%. Likewise, independently acquired identical mutations could also theoretically rescue the evolutionary model, but this explanation strains credulity. Under the evolutionary model, these creatures have undergone hundreds of thousands to millions of random mutations to a DNA sequence that is less than 20,000 DNA bases long, yet they have maintained sequence identities of 86% or greater. To postulate that these high identities resulted from separate species arriving at the same mutation repeatedly, by chance, over millions of years is to invoke a statistical miracle—a practice evolutionists reject in other fields. Clearly, homoplasy is not a tenable scientific explanation for these results. Objection 6: The results of this study failed to account for all evolutionary mechanisms. Natural selection would have eliminated millions of deleterious mutations over the past several million years in each of these species. This evolutionary rescuing device could potentially solve the numerical discrepancy problem, but it is entirely ad hoc and, therefore, unscientific. Scientific explanations must make testable predictions, and if natural selection explains why the evolutionary predictions are so far off from reality, then it must also predict levels of genetic diversity in species for which diversity is currently unknown. Until evolutionists actually make these predictions, this line of reasoning does not pass muster. Objection 7: The results of this study are simply a statistical artifact. Four species do not represent biological diversity on Earth. None of the above objections have yet to appear in peer-reviewed scientific literature—either in the creationist or secular journals. In fact, no peer-reviewed objections have been published at all to date. The objections above are ones that I anticipate or that have been expressed in popular forums such as evolutionary blogs—a common source of origins information and ideas that are unencumbered by the accountability of scientific professionals. Will evolutionists be able to reconcile these genetic data with their millions-of-years claims in geology and astronomy? The results in this article were derived using the same assumptions pervading these latter fields—for example, the constancy of the rate of change—yet these results flatly contradict the secular conclusions in geology and astronomy. Can the evolutionary community resolve this great paradox without undermining the logical foundations of their arguments for deep time? Futuyma, D. J. 2009. Evolution. Sunderland, MA: Sinauer Associates. Howell, N. et al. 2003. The pedigree rate of sequence divergence in the human mitochondrial genome: There is a difference between phylogenetic and pedigree rates. American Journal of Human Genetics. 72 (3): 659–670. We allowed the extra time because Septuagint manuscripts differ in their ages for the patriarchs. Jeanson, N. T. 2013. Recent, Functionally Diverse Origin for Mitochondrial Genes from ~2700 Metazoan Species. Answers Research Journal. 6: 467-501. This is for a subset of the mitochondrial DNA, the “D-loop,” the only region of the human mitochondrial DNA for which a mutation rate has been measured to appropriate statistical confidence. When the statistical variation in the measured mutation rate is factored in, both creation and evolutionary predictions yield a range of values, but these ranges (creation = 7–16 mutations; evolution = 124–290 mutations) are still very distinct from one another. Carter, R. The Non-Mythical Adam and Eve! Refuting errors by Francis Collins and BioLogos. Creation Ministries International. Posted on creation.com August 20, 2011, accessed January 9, 2014. * Dr. Jeanson is Deputy Director for Life Sciences Research at the Institute for Creation Research and received his Ph.D. in cell and developmental biology from Harvard University. Cite this article: Nathaniel T. Jeanson, Ph.D. 2014. New Genetic-Clock Research Challenges Millions of Years. Acts & Facts. 43 (4).